UNC Chapel Hill students are dissatisfied with a university proposal to exhibit a confederate statue in a new building. After the statue known as Silent Sam, demonstrators were overthrown on campus in August. UNC Chapel Hill students are dissatisfied with a university proposal to exhibit a confederate statue in a new building. After the statue, known as Silent Sam, police were overthrown in August by protesters on campus. The riots continue this week on the campus of the flagship University of North Carolina, after the university leaders proposed a new $ 5 million building to show the Confederate monument known as Silent Sam. 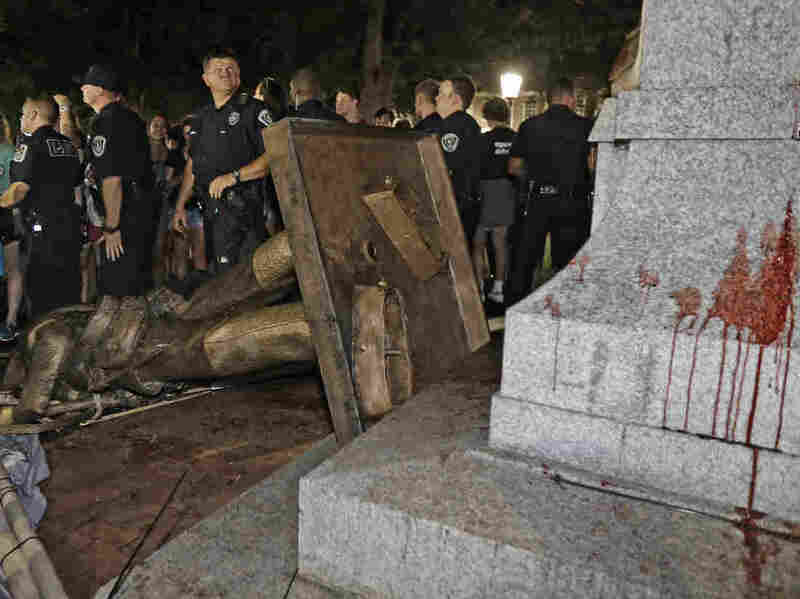 The monument stood at the entrance to the UNC campus until it was demolished by demonstrators in August. Since then, the University has wrestled what to do with the statue. Officials thought they had come up with a good plan when they submitted their proposal for a new college and university education center on Monday. But that annoyed only the students who protested hours later. Hundreds marched through Chapel Hill on Monday night singing, "It's our duty to fight for freedom," and, "We have nothing to lose but our chains." They demanded that Silent Sam never return to campus. "It's really frustrating because it feels like the university treating its minority students like accessories, things they put on their flyers or placing on their website, or their social forms make media pages," said Alex Robinson, vice president the Black Student Movement of the University . "But it's not ready to invest in what these black students need." Silent Sam was built in 1913 to honor students who died fighting for the Confederacy. The monument was then honored with a speech praising the attack of a black woman. It has always been a lightning rod for protests, including the one in August that led to the fall. In September, more than 50 black faculty members called for the statue Permanent Removal. They said their presence signals that the university does not welcome black people. Several university officials said they preferred this option, including Lowry Caudill. Before voting on the proposal on Monday, Caudill said, "We have a law, and the law prevents that." Caudill referred to a law that was passed by the Republican-controlled state legislation in 2015. It requires that every monument, if demolished, be moved to a place of similar "honor" and "prominence". UNC Chapel Hill chancellor Carol Folt told reporters Monday that the state law forbids the withdrawal of the statue from the campus. "Like everyone else, I swear to obey the law, and sometimes you do not agree with the laws," said Folt. "But I have no privilege to decide which laws I agree with and disagree with." But Folt also said that the Confederate Monument should return to its original location to ensure the safety of the public. Instead, the university's trustees recommended that Silent Sam be housed in the university's new college and education center. The preliminary plan has yet to be approved by the Governing Body of the State University System, which will meet next week. At least one member of the board, former state senator Thom Goolsby, has already spoken out against the new building, stating that, according to the law of the state of Silent Sam, it should be put back where it was.